Brain tumors in children are treated in our Neuro Oncology Program within the Upstate Cancer Center. Secondary—Cancer spreads to the brain from another site in the body. Your child’s chances are higher if they have certain genes. Certain syndromes that run in your family can also make the chances higher. There are many types of tumors. Test results and a biopsy will help find the type. Knowing this helps guide treatment. Care depends on the type and location of the tumor. Care may involve using different methods. Some methods may leave your child with lasting problems. External —Radiation is directed at the tumor from a source outside the body. 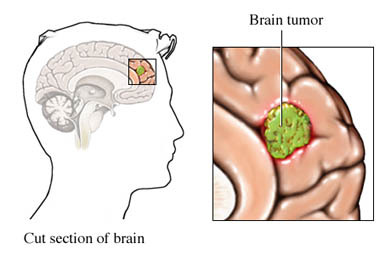 Tumors that spread from another area of the body are treated with whole brain radiation therapy (WBRT). Stereotactic radiosurgery —Higher doses of radiation can be delivered to specific areas of the brain. Your child may also work with an educational specialist. They can help with learning problems and getting your child back into school. Library resources related to brain tumors and brain cancer in children. The detailed guide includes descriptions of the causes, risk factors, prevention, diagnosis, staging, and treatments. Plain language health information from Kidshealth.org on brain tumors in children. Health information on childhood brain and spinal cord tumors from the National Cancer Institute. Includes information on staging of the tumors, and treatment options. Questions and answers regarding medical care for children with cancer. MedlinePlus search on "pediatric brain tumors"
Link to a search of the MedlinePlus database for health information on brain tumors in children. MedlinePlus links are managed by medical librarians at the National Library of Medicine. Information on brain tumors in children from the American Brain Tumor Association. Includes general information about brain tumors, and links to specific tumor types.